The power of positive thinking is well-documented. But what about positive self-talk? How do you talk to yourself? (It’s okay, you can admit talking to yourself… we all do.) Is your self-talk positive and encouraging, or is it negative and pessimistic? Unfortunately, our self-talk is often tainted by guilt about the past and/or anxiety about the future. This negativity can be self-defeating, as it relates to our goals and dreams. Our actions are inspired by our thoughts, and our thoughts are significantly impacted by the way we talk to ourselves. If we can change the way we think — and change the way those thoughts manifest themselves in self-talk — we can begin to change the actions we take. Self-talk is, basically, what you say when you talk to your mind. You can change a lot by changing what you say when you talk to your mind. When you repeat positive self-talk, you become a different person. You can use positive self-talk to change the message and push your inner voice in a positive direction. Focus on the desired outcome or goal, and repeat positive affirmations that build positive thoughts. Say them aloud and with feeling, and repeat them frequently. Create a positive “script” for success. Putting your goals and dreams in writing — and the steps toward their achievement — will help you start to internalize them. Eliminate negative influences and replace them with positive ones. It’s important to identify external negative factors in your life which may be holding you back. Surround yourself with thoughts and actions from people who will empower you. The positive energy they produce will start affecting the self-talk that you engage in as well. Think in the present tense. If you find yourself getting bogged down, stop and say, “What can I do right now?” Re-focus your internal talk from an uncertain future to the more manageable present. You can’t control what will happen in the future but you can take the necessary steps now that will build a better tomorrow. Face your fears. Fear is often what holds you back from success. We often avoid taking chances because of the (perceived) fear that comes with losing the security that you enjoy now. Ask yourself what you are afraid of. What is the worst that can happen? When you confront your fears, you will often realize that the worst case scenario is not as bad as you think, and the benefits of change are worth the risk. Focus on the good times. It’s much easier to have a positive attitude if you focus on the enjoyable moments in life rather than the difficult ones. Sure, there will be challenges — life is full of ups and downs — and sometimes the good times are created through the bad. Make it a conscious habit to fill your mind with positive thoughts and images. Be grateful for what you have today. 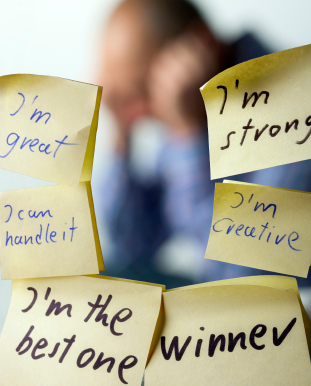 Replacing negative self-talk with a more positive one is not going to happen overnight. It will likely take some time and effort. By following the above tips to positive self-talk, you will experience an improvement in the quality of your life. Best of all, you feel empowered. And these strategies apply to everything from dealing with family and friends to delivering a business presentation; from preparing for an exam to shooting free throws. VERY Powerful words Brian! I love the article! The mind is everything. What you think you become…..I keep this quote on the bathroom mirror. We read it every morning and before we go to bed! A couple of things I may try…Thanks Brian! You’re welcome, Holly… thanks for reading and for the feedback!